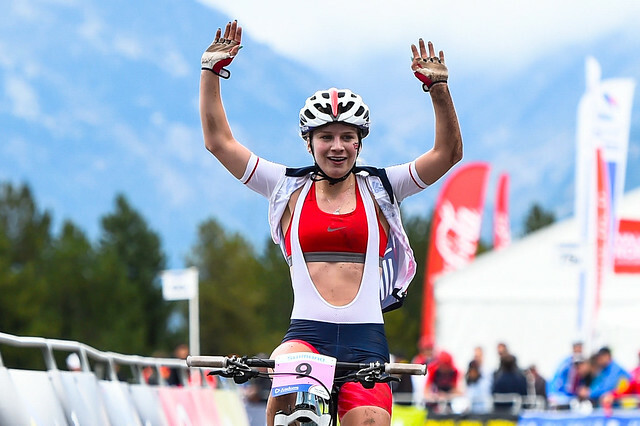 Great Britain Cycling Team’s Evie Richards won silver with a gutsy and gifted ride in the junior women’s cross-country race at the UCI Mountain Bike World Championships in Vallnord. The 18-year-old rode superbly for four laps on a technical, high altitude course to take her place on the podium in Andorra on Thursday. She completed the 16.8-kilometre event in one hour and ten minutes, one minute and twenty seconds behind Italian winner Martina Berta. For Richards, who has won four medals in the UCI XCO Junior Series this year, a silver medal on the world stage completes a superb season for the talented youngster who is part of the British Cycling Olympic Junior Academy Programme. Ffion James fought hard to finish 13th for Great Britain, starting quickly and moving up two places in the final lap. Richards, sixth in last year’s race, started superbly and opened up a gap of 20 seconds after the first lap at the Pal ski station. But a crash on lap two saw her clawed back by Berta and by the end of the lap the Italian had turned the deficit into a lead of 42 seconds, an advantage she would not surrender. In the junior men’s race, Frazer Clacherty was Britain’s highest finisher in 10th. The 18-year-old worked his way through the field superbly in cold and wet conditions to secure the position in 1:18:38 after five laps. Tom Craig was 20th, starting strongly and at one point in the top ten before gradually moving back. Mark McGuire crossed the line 30th. The championships continue with the under-23 men’s and women’s cross-country races on Friday.